Located opposite one corner of Chitlada Palace in the Dusit district is one of the most beautiful temples in Thailand, Wat Benjamabopit. Often referred to as "the marble temple" in guidebooks, the temple is unusual in many ways. There has been a temple on this spot since Ayutthaya times, before the founding of Bangkok, but little is known about exactly when it was consecrated. Its modern history begins in 1826, during the time of Rama III, when a prince set up defenses around the old temple to fend off an invading Lao army. The army never actually reached Bangkok. They were defeated in Nakorn Ratchisima (Korat), by the wife of the provincial governor. In gratitude (whether it was for victory or for not having to fight, we're not sure) the prince and his four siblings had the temple restored and erected five pagodas in front of it. The ubosot is covered on the outside by marble imported from Italy. In plan, the ordination hall is 'T' shaped, with a long aisle extending from the main entrance to the altar. Small side-aisles on either side of the altar lead to exits into the cloister. The altar and its main Buddha image are the most beautiful in Thailand. 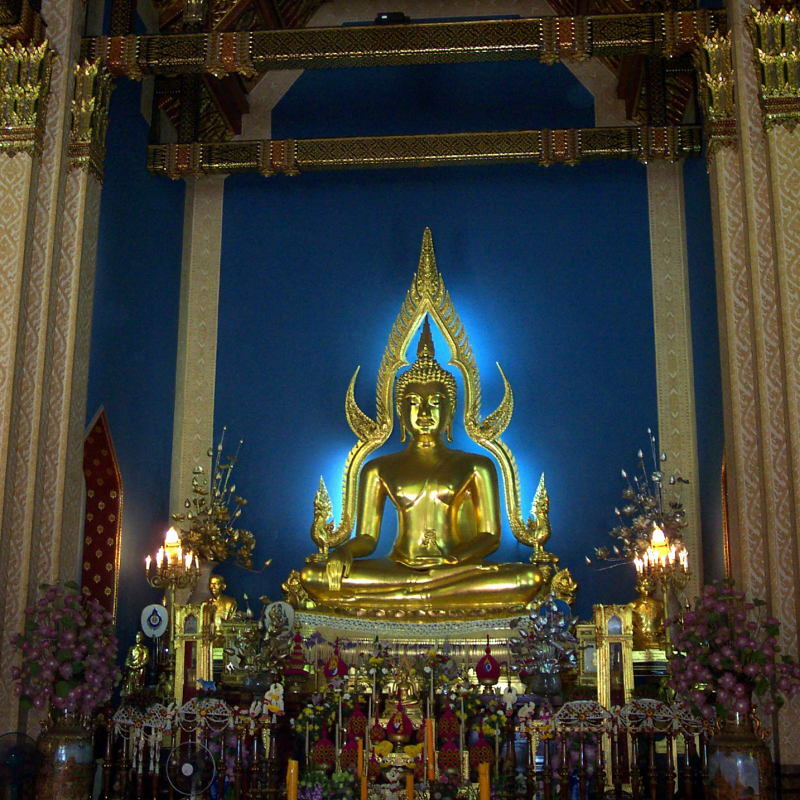 The Buddha image is a copy of a highly revered image, Phra Buddhajinaraja, in Phitsanulok province. King Chulalongkorn himself presided over the casting of the image in Bronze. The image is enthroned against a dark sky-blue background. A golden 'flame' frames the image. The windows of the ubosot are a type of stained glass in yellows and white. The ceiling is a beautiful beamed affair in dark red and gold. The ubosot sits in one wall of a cloister. Although cloisters are quite common in Thai temples, usually the ordination hall stands wholly within the cloister. The cloister is lined with many Buddha images. These too are unusual. In most temples, all the Buddha images lining a cloister would be more or less the same, but in Wat Benjamabophit, every image is different. Some are seated while some are standing, all with different poses. There's even an example of the emaciated seated Buddha image that is now very rare. Behind the cloister is a large Bodhi tree. This tree was bought from Bod Gaya, the place in India of Buddha's enlightenment, as a gift for King Chulalongkorn. Along the south side of the temple is a canal. It was built at the time of the 1900 restoration to separate the temple compound from the monk's living area. Immediately across the canal are several interesting buildings. Closest to the eastern wall is the Song Dharm hall. Its a two-storey brick building with elaborately carved gable ends. The hall was built in 1902 by Queen Sawang Vaddana in memory of the Crown Prince, who met an untimely death. Its purpose was to provide a place for King Chulalongkorn to come on holy days to listen to Buddhist recitations. It is now sometimes used for the lying-in-state of some members of the royal family. Next to the Song Dharm hall are two buildings. The open sided Sri Somdej Pavilion now houses several drums. Among them is a 16-foot long Shan drum captured in 1903 during a Shan uprising. The drum is carved from a single block of rosewood. Behind the Sri Somdej Pavilion is the Song Phanuat hall. This was originally built in the Grand Palace for King Chulalongkorn when he entered the monkhood. 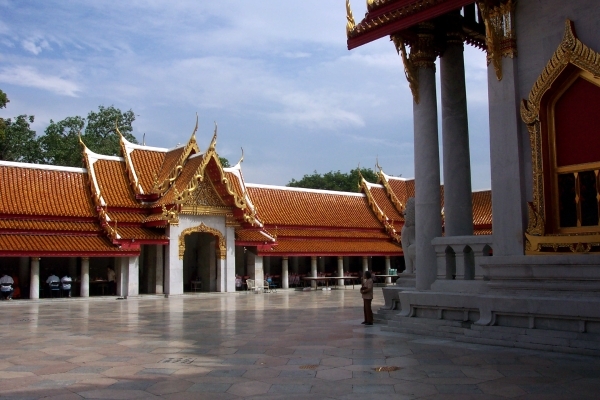 During the restoration of Wat Benjamabopit, the King had the building moved there to serve as the abbot's residence. The building is actually four small buildings linked together around a central courtyard. Next to the Sri Somdej Pavilion and Song Phanuat hall is a large lawn with an ornate bell tower in the middle. On the other side of this lawn is the Somdej wiharn. This building houses several important Buddha images, but is undergoing restoration in 2003 and may not be open until later in the year. There is a 20 Baht (0.52 USD) admission fee payable at the kiosk to the right of the entrance. Wat Benjamabopit is one of the few places that is difficult to get to by public transport alone. We suggest taking the Chaophraya River Express boat to Tewet pier and the grab a tuk-tuk to Wat Benjamabopit. The other option is to take the Skytrain to Phyathai station and then find a taxi on Sri Ayutthaya road to take you to the temple.